If you take your kids to a city planning meeting, evidently they’ll take your picture. 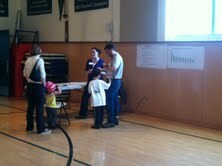 We attended the SF MTA’s open house for separated bikeways on Oak and Fell the other weekend. Matt commutes along the panhandle of Golden Gate Park, through the Wiggle (“the Wiggle is the Bomb”), and up Market Street to the Financial District. The ugliest part of this trip by far is the three blocks of Oak (eastbound) and Fell (westbound) that separate the panhandle from the Wiggle, although Market Street is pretty intense as well. Advocacy to make this section of the city safer has been going on for years, and the MTA is now proposing separated bikeways on Oak and Fell, which would, not to put too fine a point on it, be awesome. Maybe I’m unadventurous and unwilling to exercise my rights to Take The Lane, but when riding down Market Street with a kid on the back of the bike, I prefer the segregated bike lane to having Muni buses huff at my neck. Oak and Fell, same same, but with a much higher ratio of stressed out car commuters. As this is Matt’s daily commute route, he was pretty interested in the plans. This was our first visit to one of these, and evidently they were trying out a new open house format instead of a hearing; there were staff there to describe the proposals, swaths of paper on the wall for comments, and maps where people could make specific geographic suggestions (e.g. “get the tow trucks always parked in the bike lane at this corner to go away” or “put mirrors on poles here so cyclists can see cars coming and I don’t have to stare death in the eyes every morning please”). And given that it was held in a school gymnasium, there were lots of balls for the kids to throw around. I’ve been to public hearings before and I assumed that the kids would last 15 minutes at most, but given the format and toys we stayed for almost an hour. An interesting discovery as we’ve begun biking more is how much more willing we are to just drop by places outside of a walking radius if we don’t feel confident the kids are going to have a good time. In the event of meltdown just hop back on the bike, and boom, we’re having fun again. My daughter’s unwillingness to remove her helmet made it clear that we were there as bicyclists. Self-identified as a competing interest were a handful of local residents; this was my first introduction to people in San Francisco who are hostile to bicycling when they were outside of their cars. The plans themselves looked good to me; the general outline was to remove a lane of parking on both streets, possibly permanently or possibly just during daytime hours, and make the space a separated bike lane. I thought the proposal to make the bike lanes two-way given that they would both be on one-way streets was crazy, I admit. But even as an occasional driver along these streets, I would love to see a parking lane removed; every time a car tries to park in traffic, it creates a tailback that can go as far back as Golden Gate Park. And there is always, always traffic on Oak. I think it would be fair to say that residents along those blocks viewed the possibility of having a parking lane removed with less equanimity. One woman in particular asked me how many times I blew through red lights (for the record: never, dude, my kids are on my bike), complained that cyclists should be paying for any street improvements by being forced to register and insure their bikes, complained about the dismantling of the Embarcadero Freeway et al and suggested more freeways in the city (seriously? ), and insisted that there didn’t need to be any connection between the panhandle and the Wiggle because cyclists could just use one of the existing sharrows that went up a steep hill. “If you want to bike in San Francisco, you’ll just have to learn to go uphill.” Etc. I suppose if you want to maintain a population of cyclists who are young, fearless, and scofflaws, policies like this would be a good way to ensure that outcome. My husband and I have never been very attached to cars, having lived without one for years. Even Matt’s parents are a one-car family, as we are now, which always seemed like plenty of car to me, if not too much at times. We pay to park our car and it is definitely not cheap, although I suspect we’re not paying full freight. We have lived places where parking was free to us but I’ve never expected it, certainly not in a dense city like San Francisco. So we found it bizarre to hear people demanding that they be entitled to free parking on the street near their homes, which was the main message I got from the residents attending the meeting. Apparently we are loony. The secondary message from the same people was that they wanted reduced car traffic, which sounded like a good idea to me, albeit completely antithetical to providing lots of free parking. People always over-consume things that are free. This concept is day 1 of any micro-economics class, an easy introductory topic because absolutely no one needs to have it explained. Lots of free parking=lots of driving. I don’t really mind paying for parking just like I don’t really mind paying for the water and power that we use at home; sure, it would be great for me to pay nothing, but I recognize that these are either limited or expensive resources. In some ways the battle over “free” parking reminds me of the fierce hostility, when I was a child, toward the city’s new garbage pickup policy, which involved paying by the frequency of pickup and the size of the can. You would have thought that producing unlimited garbage and paying a flat rate for pickup was a right enshrined in the Constitution from the spittle-flecked invective hurled at local government during that first year. Now of course it seems totally reasonable to everyone to pay for garbage pickup based on volume (on the West Coast, at least; I have heard, although I still have difficulty believing it, that this is not yet standard practice on the other side of the country—one person told me that even water was unmetered, which I refuse to believe because it is completely absurd, like paying a flat monthly fee for the right to drive into any gas station at any time and fill up anything from a lawn mower to a Hummer). I’ve never heard anyone say a bad word against user fees as long as they are abstract, but the rubber really seems to hit the road when people realize that they’re going to be charged for things that they themselves use. Hear, hear! Glad that you have enough sense of humor to deal with the cranks at SF community meetings. Used to be that the loudest voices (ie, cranks) got the most attention. And legitimacy. Maybe this is changing? Completely agree with you that car-owning ‘neighbors’ have an outsized (and unwarranted) sense of free parking entitlement. Keep pushing for removing parking and getting dedicated non-car-ways!